Transform your outdoor space into a peaceful oasis with the help of the charming outdoor living decorations that we carry here. 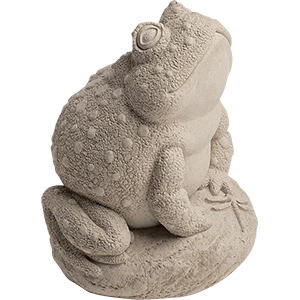 Our outdoor decor includes a range of garden statuary, garden wall plaques, and other garden accents in excellent nature, religious, and fantasy-themed designs. These eye-catching pieces feature designs like animals, angels, fairy houses, the Greenman, St. Francis, and many more. 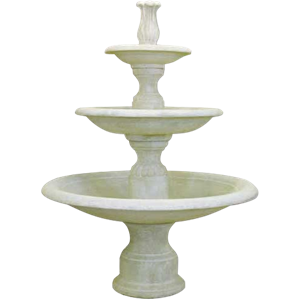 Perfect for decorating your patio, deck, front walk, lawn, or garden, our yard ornaments are crafted from sturdy materials like concrete, metal, and stone to withstand the rigors of the elements. Much of our garden decor makes a fantastic option for anniversary or house warming gifts, especially for gardeners and nature lovers. This section also houses all our miniature fairy garden statues and accessories, wind chimes, outdoor thermometers, plant pots, and plant stands. Take a moment to browse, and you will surely be inspired by all our creative outdoor decorations. Invite the magic of fairies into your surroundings with all our miniature fairy garden decor. We have everything you need to construct your own miniature fairy garden here. 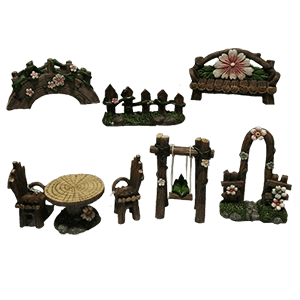 From quaint fairy garden cottages and fairy home tree doors to fairy garden signs, furniture, and fairy garden figure sets, our expansive selection is perfect for piecing together your own fairy neighborhood! We have fairy garden moss, tree stumps, and planter displays that will lend an earthy look to your miniature fairy village, as well as adorable miniature fairy statues full of character. Soon you may find a fairy city on your hands! Craft the perfect home for any kind of fairy with these collectible outdoor decor pieces. Whether you want to bring fantasy style to your outdoor decor or you want to further emphasize the beauty of nature, shop here for our selection of outdoor statues and plaques. Our greenman and floral plaques bring a welcoming touch to gardens and yards, and items like our outdoor dragon statues will ensure your yard decor will stand out from the neighbors. We offer gorgeous fairy and mermaid garden sculptures and bird feeders that will make you feel as though you are in the fairy realm whenever you step out the door. Our religious and Celtic-themed garden decor will bring timeless elegance to yards of any kind. No matter your personal style, you can show it off on the outside of your home, too, when you decorate with our outdoor statues and plaques. The next time you pot a plant, plant a bit of magic with it as well when you put it in our plant pots or place it on our planter stands. We offer a selection of flower pots and garden planters in unique fantasy and medieval styles here. 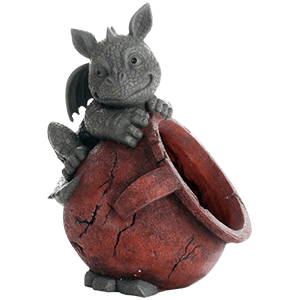 Check out dragon garden pots and fairy flower pots as well as greenman planters and fleur-de-lis planter stands. We also offer select gothic garden decor, such as our skull planters, for those who prefer a slightly more grim style to contrast with the blooms of their favorite flowers. Keep checking back as we add more fantasy, gothic, and medieval items to our selection of plant pots and stands as they become available. A day spent listening to the soothing, melodious sounds of any one of our numerous wind chimes would not be a wasted day. Instead, it would be a wonderful use of time spent recharging ones batteries and unwinding from a long, arduous day spent in a world that moves at a breakneck pace. Each one of our wind chimes is an elegant, beautiful piece of decor that will serve equally well if hung indoors instead of the traditional outdoor location, where the wind chime will produce their eerily haunting yet beautiful melodies whenever the wind blows. Our wind chimes feature a diverse array of designs.  We offer wind chimes that have suns, moons, and stars, and we also have a number of tasteful and visually stunning wind chimes that make use of stained glass in their construction. 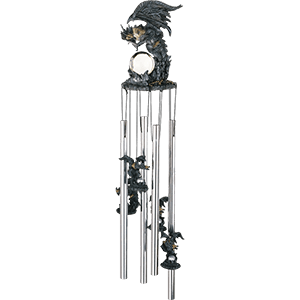 Many of our wind chimes are made of high quality pewter, copper, or hand painted cold cast resin. But the one thing that all of our wind chimes have in common is that they all produce a soothing and appealing sound when the wind catches them, and they all are stunning pieces to decorate with or give as gifts. So if you need to unwind and relax, or if you know someone who does, then maybe a nice, soothing wind chime is exactly what they need. Keep track of the temperature with our medieval and fantasy thermometers. Nothing will help you know the temperature with more immediacy than with a glance at one of these decorative wall thermometers. 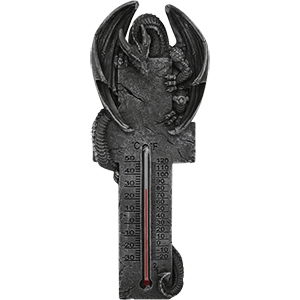 In styles that range from gargoyle-themed to dragon, fairy, and steampunk-inspired, our thermometers typically feature both Celsius and Fahrenheit temperature scales. Not only are they helpful for checking up on the temperature, they also bring flair to wall space, lending a touch of fantasy or medieval fashion or further complementing your decor. Shop all our thermometers here, from hand painted, stone-look dragon thermometers to clever steampunk clock and thermometer combinations.